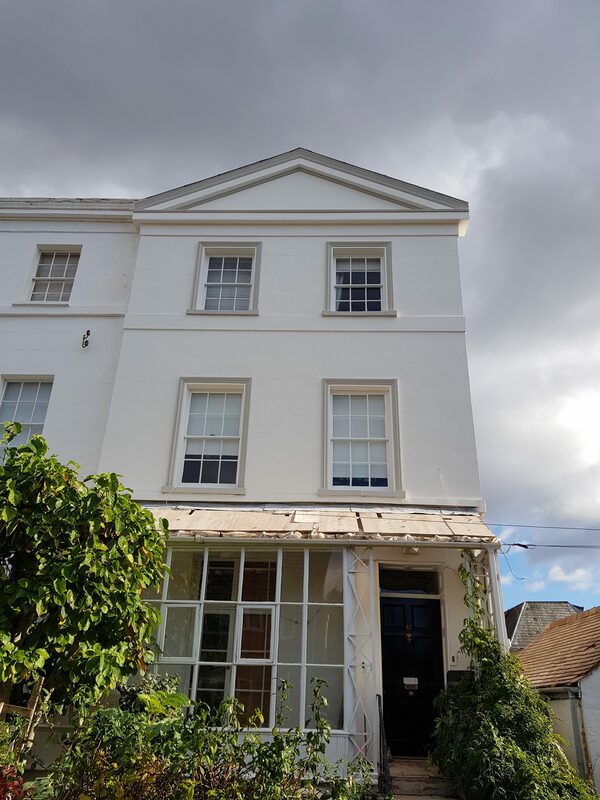 We were tasked by our client to restore their lovely townhouse, including the external decorative lime plaster. 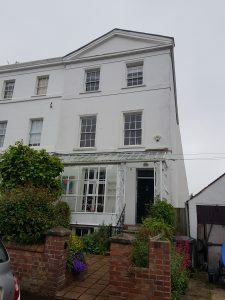 The house has not had a huge amount of work done to it for quite some time and when we hacked off the existing render, we discovered a multitude of repairs to be made before we could consider re-plastering. The client is based abroad and we were liaising via email mainly. 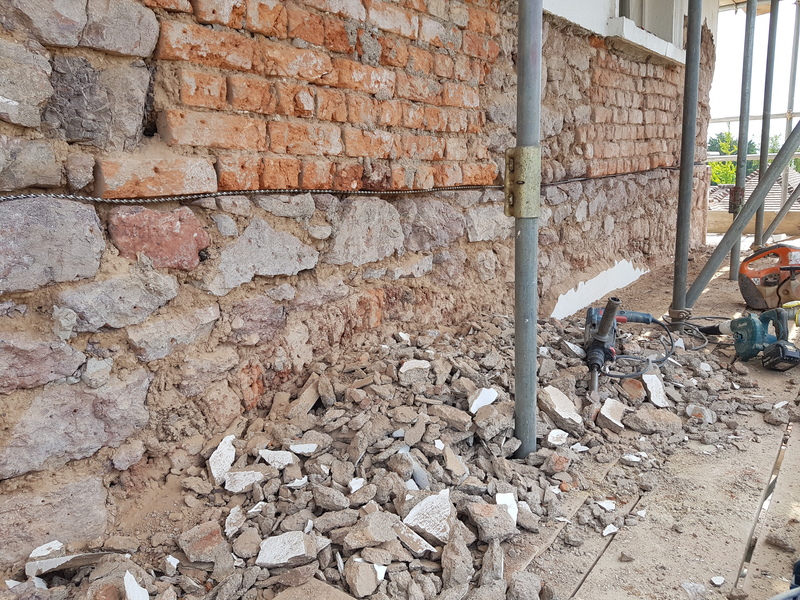 It can be difficult when you don’t meet a client face to face; we were relying on photographs to show the client the extent of underlying damage to their property. Before Earthouse could get on site, we arranged the scaffolding via Shane Hardy Scaffolding Ltd. Scaffolders at this time of year are incredibly busy and we had a tight schedule to work to. 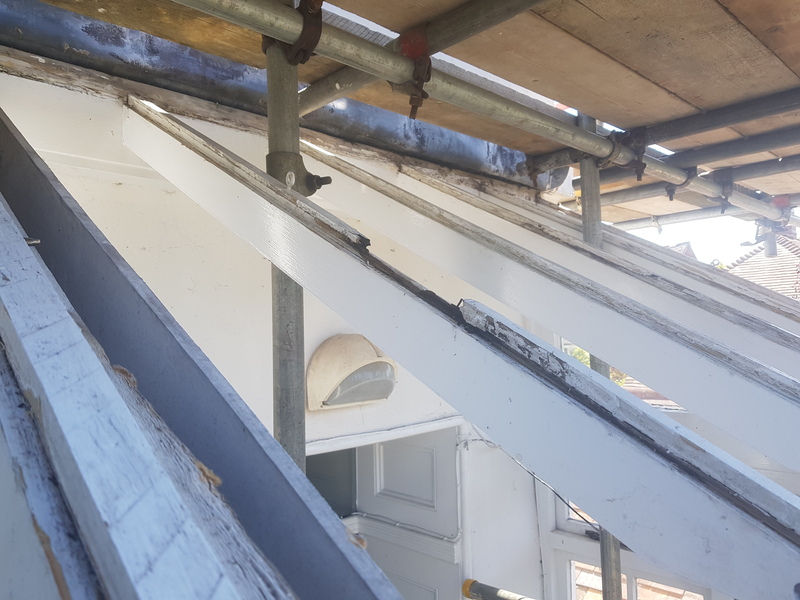 The property has an old glass conservatory at the front and we needed to remove the glass panels so the scaffolding could be erected close to the house. We used locally based Cullompton Glass & Glazing to do this. The glass panels are now being carefully stored by them, ready to be replaced once we have finished the rendering work. The glass panels in the conservatory were removed to make way for the scaffolding. The render on the building was cement based and incredibly thick as you can see on the photograph below; getting it off the building was hard work, especially during this summer’s heatwave! 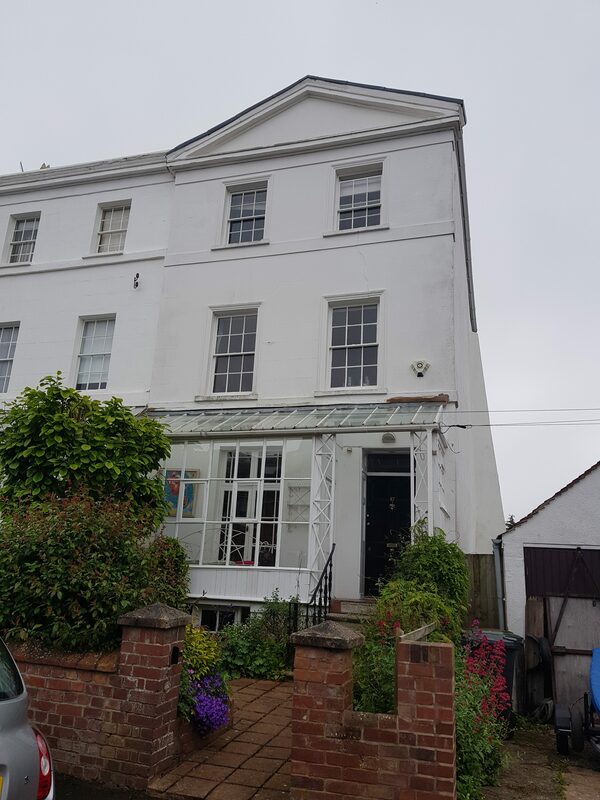 Our team worked tirelessly for a week hacking the render off so we could get started on the restoration work. The problem with cement based render is that if any defect in the building or roof allows water ingress, the water is unable to escape through the cement render. 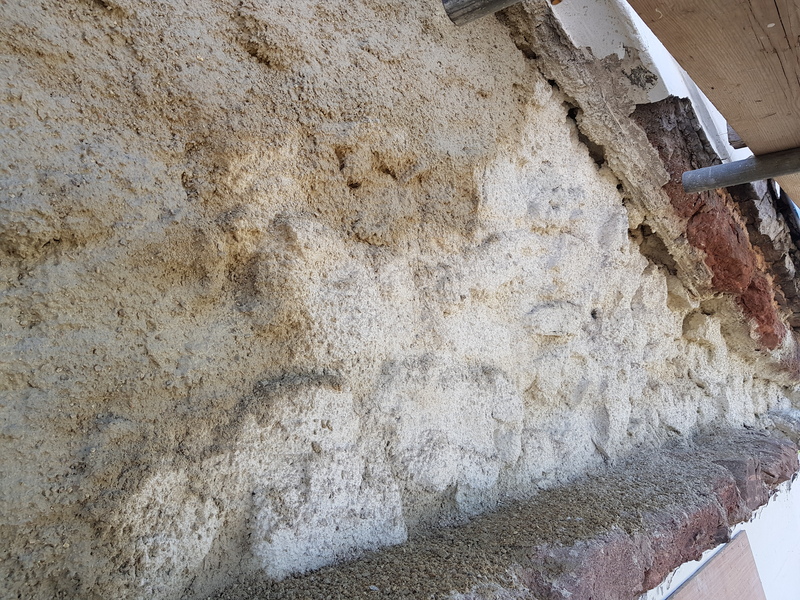 This causes a build up of water within the structure of a building and during excessive cold or hot periods, it can do a lot of damage to your walls. The frost and thaw process means that water turned to ice expands and cracks the substrate. 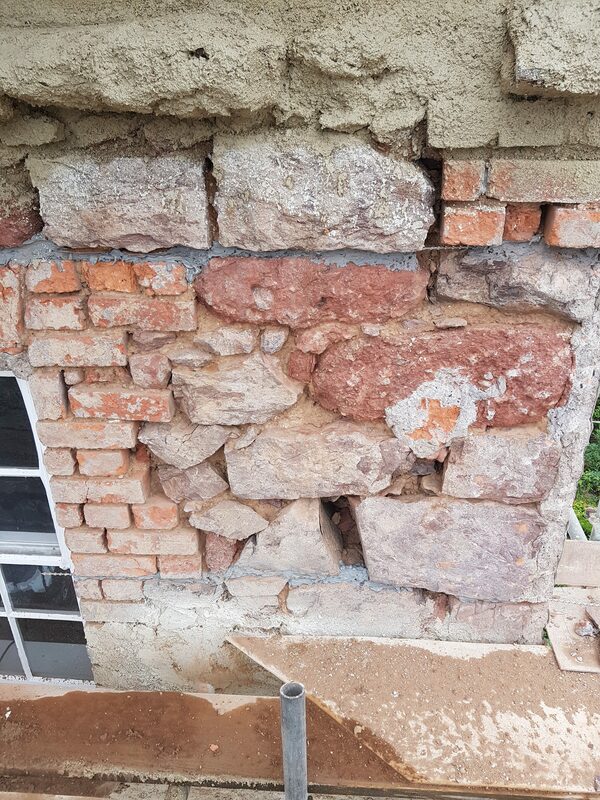 In this case, the substrate was stone and you can see on the photograph below that the water had cracked the majority of stone in this top elevation of the house, leaving it very unstable. 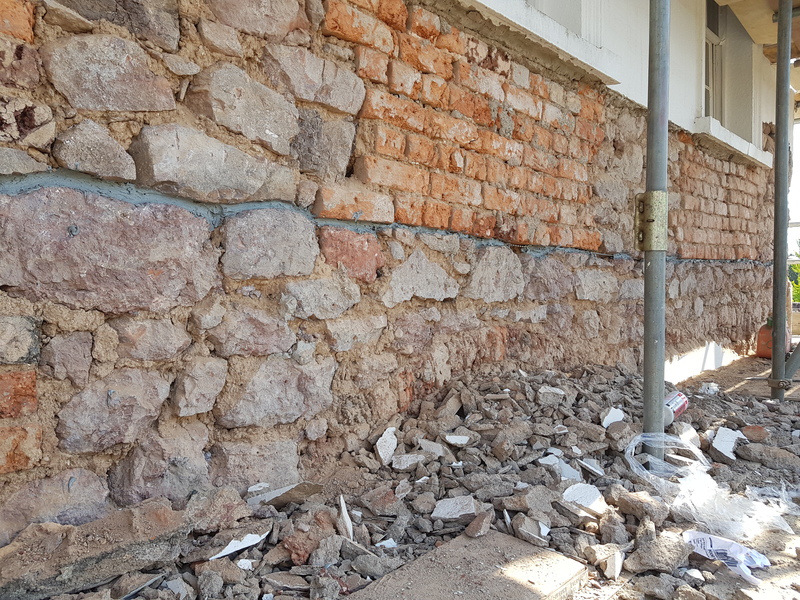 In order to ensure that the damaged stone in the photo above was stabilised, we raked out all the loose pieces and packed the area with lime prior to rendering. Lime render being used to stabilise the stone work. 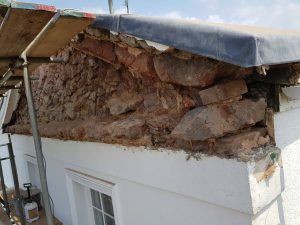 On other areas of the house, there were a number of repairs to contend with. In the phot below you can see how we have used stainless steel helipads and resin to repair and stabilise the stone and brick work on top of the stone plinth. 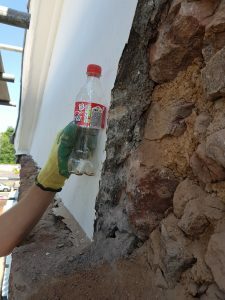 Lime is the correct material to use on this type of building. It allows moisture to dissipate in a way that sand and cement based renders do not. 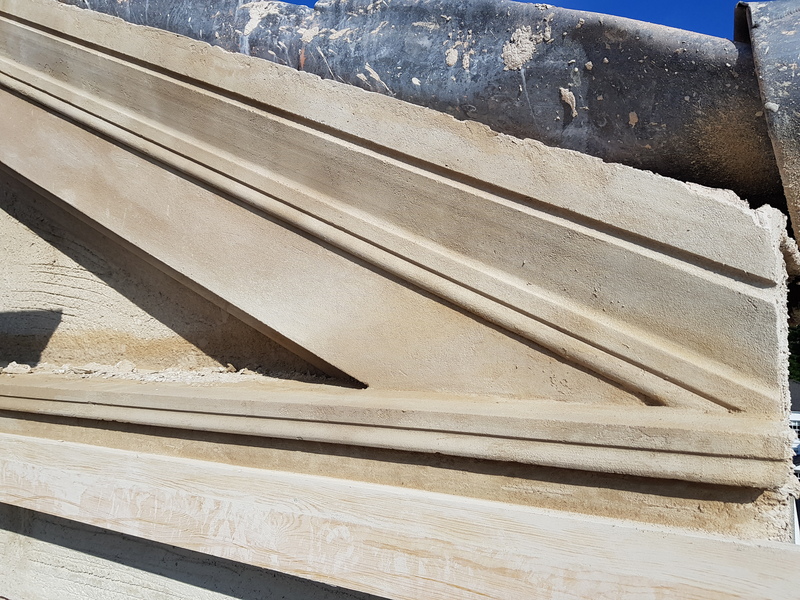 For the exterior walls we have used … in a three coat build up. We always find it quite amazing to look underneath the render of a house and discover that it is not as you might expect. You may imagine that houses are built solely of brick or of stone, and perhaps they were initially. However, their history may have seen repairs and additions and you may find that a house is constructed of various types of stone from different localities and various different bricks. The worst cases we have seen are where rubble has literally been stuffed haphazardly into gaps! The photo below shows just a few different building materials on this house. Prior to us commencing the removal of the existing render, we took profiles of all the areas of decorative plasterwork. We did this so that we could replicate the existing decorative lime plaster exactly. 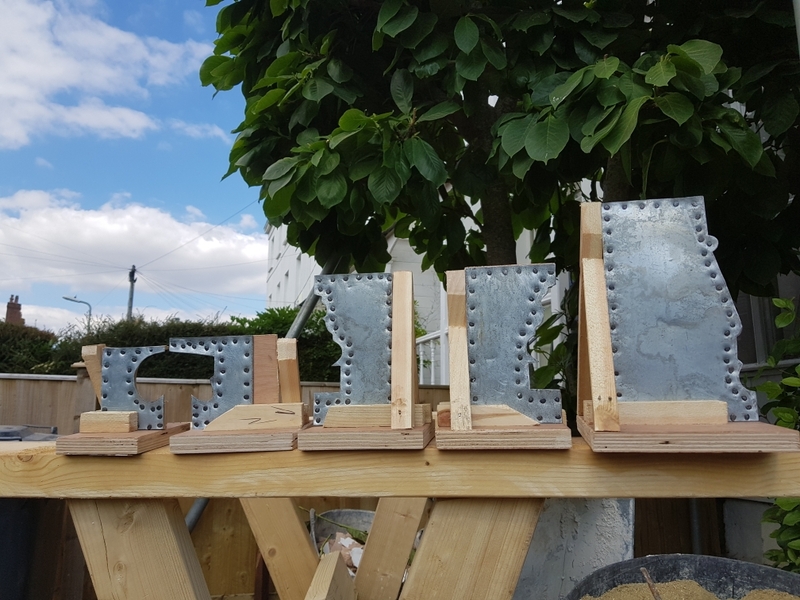 Once the profiles were taken we were able to create templates from wooden blocks and stainless steel, which we could then use to shape the lime plaster as per before. In order to be able to do this, we used a particularly thick mix of lime plaster so it would hold the shape. We shaped the plaster when wet and then allowed to dry slowly. 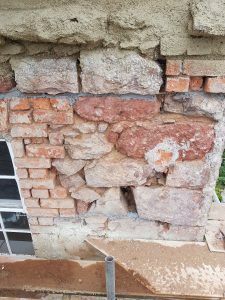 It is imperative in this extremely hot weather that lime plaster does not dry out too quickly as it will crack. In order to slow the drying process we mist the walls with a fine water spray and we also use wet hessian ‘curtains’ on the scaffolding. When the breeze passes through the wet hessian it cools the walls. 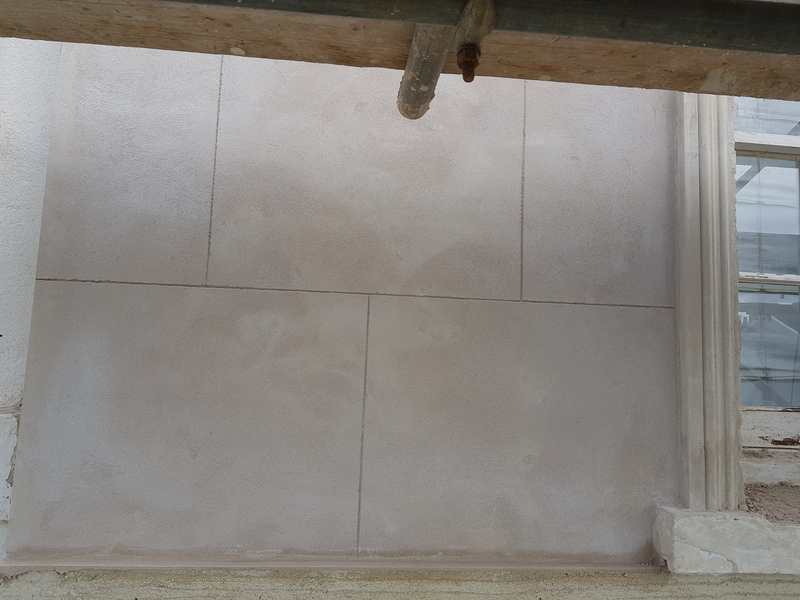 To see how we formed the intricate decorations on the lime plaster, have a look at our video. 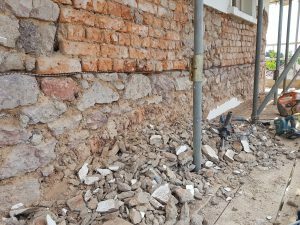 In order to retain the character of the building we have reinstated the lines that would have originally appeared in the plasterwork. After we had created the tools above, we used these to recreate the original Georgian decorative plasterwork. This was mainly around the top of the house, although there was some work to be done around the windows. 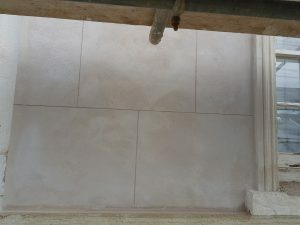 Lime plaster is a breathable surface material. In order to preserve this breathable quality, lime plaster should be painted using a breathable coating. This could be a lime wash or a silica paint. On this occasion we recommended using silica paint from Farrow & Ball. After taking advice from the local Planning Office, our customer also spoke to their neighbours; in a row of houses it is also a good idea to find out if anyone else is planning a near future repaint and if so, to see if an element of colour matching could be incorporated. Depending on where you live there may be different restrictions in place as to what colour you can use on your property; this is particularly important to take into account when painting a listed building. However, on this occasion there were no restrictions in place. So that the house remains sympathetic to its surroundings, a near match to the existing white colour is being used. Our customer also opted for marginally darker grey to pick out the detailing on the decorative plasterwork. The photo above shows the property re-plastered in lime and re-painted using a silica paint system. The glass work is yet to be completed, hence the protection on the conservatory. We hope this gives a good idea of what Earthosue can do for your property. To find out more abut the projects we work on, please visit our Blogs page.